BORED AND BRILLIANT: How Spacing Out Can Unlock your Most Productive & Creative Self by Manoush Zomorodi – Books, Books and More Books! Has your smartphone become your BFF? Do you feel bored when you’re not checking Facebook or Instagram? Bored and Brilliant: How Spacing Out Can Unlock Your Most Productive and Creative Self explains the connection between boredom and original thinking, and explores how we can harness boredom’s hidden benefits to become our most productive selves. In 2015, WNYC Studio’s ‘Note To Self’ host Manoush Zomorodi led thousands of her listeners through a week of experiments designed to help them reassess their technology habits, unplug for part of each week and jumpstart their creativity. Throughout the book are a series of challenges that will help readers rethink their relationship to their devices without completely leaving the digital world. Zomorodi also explores why putting greater emphasis on “doing nothing” is vital in an age of constant notifications and digital distractions. She speaks with neuroscientists and cognitive psychologists about “mind wandering”–what our brains do when we’re doing nothing at all, and the link between boredom and creativity. Thinking you may be spending way too much time on your Smartphone? I think it’s safe to say most of us are! In 2015, the author led 20,000 listeners of her show on NPR, through 7 challenges which she shares with us in this book. They aren’t difficult but they are very eye-opening. The book doesn’t bash technology, but emphasizes the human aspect of everyday life and the need for mind wandering, daydreaming if you will and the creative and productive results of doing so. It’s about balance. Excellent read and a very good radio show! I’m drawn to books on creativity and will keep my eyes out for this title thanks to your review! I’m putting this on my TBR! 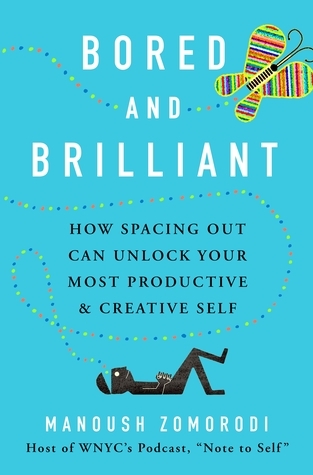 Pingback: BORED AND BRILLIANT: How Spacing Out Can Unlock your Most Productive & Creative Self by Manoush Zomorodi * Congratulations on Release Day* – Books, Books and More Books!